Webinars are the have quickly become the standard for the new marketing culture of “permission marketing.” Permission marketing is based on the knowing participation of potential consumers in the marketing process. Consumers do this because they think the marketing materials will help them make better decisions. Webinars are growing because, put simply, online consumers are getting smarter and spending more. Major business purchases and contracts are now more likely to start with an internet search than a personal phone call. When people are spending thousands of company dollars buying services on the internet, they want to be sure that they are buying from experts. Webinars are a great way to demonstrate your expertise and communicate your company’s value to people who really need to know everything before making a purchase. It is a common claim that webinars will help any industry. That is true, to an extent. Some people will attend webinars on almost any subject just for the love of knowledge. However, depending on your industry and your expertise, the amount of value you get from a webinar will vary greatly. Some tech companies who make large business contract sales have seen their business almost double from a webinar, while small purchase service companies have seen more modest increases (check out the case studies here). However, while webinar marketing might not always be that magic bullet to make your business work, it is not likely to result in a large loss. 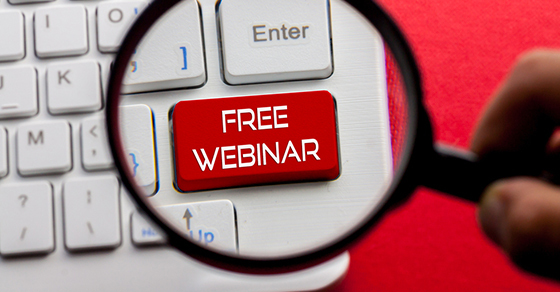 Webinars are easy to set up and just require your expertise to be a success. Want to try webinar marketing? There are a few best practices to help make sure you get as much out of it as possible. Pick a focused topic. If your webinar is too general, all it will succeed at is boring a large number of people. Instead, be willing to attract a smaller audience with an engaging and specific topic. Develop a voluntary email audience. The vast majority of webinar participants come from opt-in mailing lists. Optimize your newsletters and emails to avoid spam traps and to grow your mailing list. When you run a webinar, you will attract more interested voluntary participants. Use automatic reminders. Automatic email reminders and follow-ups are a tried and true way to increase webinar attendance. Even better, they can be run easily through existing drip marketing infrastructure. Remember to segment your email audience by industry, geography, and specific interests. This will help you optimize and personalize email reminders. Use webinar questions and feedback for market research. Pay attention to the questions that attendees ask. If the same question comes up often, try to incorporate it into future marketing materials. Even if your webinar fails to generate a lot of leads, it still can pay for itself in market research. Webinars work best from a solid foundation of good marketing sense, wide mailing lists, and excellent personal expertise. If you have all three, then you should try incorporating webinars into your marketing strategy.